The JPO is within the Program Executive Office Ground Combat Systems, supporting a range of effectors including the Heavy Brigade Combat Team, the Stryker Brigade Combat Team and the Brigade Enhancement programme, which is tasked with tying the Current Force into the Future Force. “We give soldiers the tools they need to execute the heavy combat task and robots tie into that on the ground side,” Col. Braden explained. The JPO is organised into three tiers: Maneuver -infantry, mechanised and armoured forces; Maneuver Support combat - engineers and military police and Sustainment - Combat Service and Combat Service Support. Initially a new initiative, the Joint Robotic Repair Facility was created to reflect the expanded role. That title was subsequently changed to the Joint Robotic Repair & Fielding activity and supports the current fight both in Iraq and Afghanistan. Embedded Repair Fielding Teams go out with the UGVs to units, something Col Braden believes needs to be increased. A range of systems have been used. Colonel Braden cited a number of systems including the MV-4, acquired from Croatia, reflecting that country’s experience in clearing minefields. He noted that once in the field in Iraq, units also began to use it like a mine flail, roller to clear areas and a unit rolled through. The first UGV systems were put in the hands of the EOD community, reflecting the self evident priority. 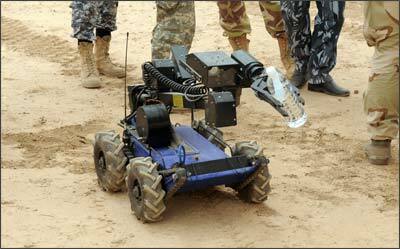 Now each EOD unit has several UGVs, providing a high degree of flexibility. While Afghanistan and Iraq in particular have been the crucible for UGV development, available systems have been developed ‘under fire’ While the enduring role for UGVs are secure, their development under the Future Combat Systems (FCS) programme has been more deliberate and necessarily so in delivering a concept that calls for the integration of unmanned air and ground platforms and the accommodation of manned unmanned teaming. For this dismounted soldier, the key programme has been the Small Unmanned Ground Vehicle (SUGV) a small, portable reconnaissance robot. The need for an improved display and control solution for operators that doesn’t interfere with the user’s immediate situational awareness (SA) is a key requirement moving forward. One of the initiatives of the Joint Project Office is pushing for, is the integration of UGV control functionality on a soldier’s weapon. “The one thing is that we never want is to look down when we are in harms way,” commented Col Braden. “Nobody looks at somebody who is pointing a weapon down range as someone who is not in the fight. If we can put the situational enhancement on the weapon, that would be a win-win for everybody.” Col Braden notes that work on putting the display from the UGV onto the eye in pilot programmes is looking very promising.